"Stephen Sondheim's legendary musical includes such classic songs as Broadway Baby, I'm Still Here and Losing My Mind. Featuring a cast of 37 and an orchestra of 21, Follies is directed by Dominic Cooke (Ma Rainey's Black Bottom). 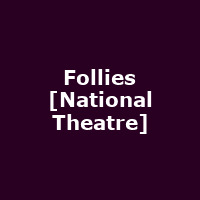 Follies made its debut in 1971, winning Academy, Tony, Grammy and Olivier Awards.